When plugins are closed or disabled, there should be a drop-down selection to list WHY this happened. 2860.diff​ (3.7 KB) - added by jdgrimes 20 months ago. 2860.2.diff​ (4.1 KB) - added by jdgrimes 20 months ago. 2860.3.diff​ (4.5 KB) - added by jdgrimes 19 months ago. plugin-dir-plugin-closed-date.patch​ (1.5 KB) - added by joostdevalk 17 months ago. show-close-date.patch​ (1.2 KB) - added by joostdevalk 17 months ago. So, I've gone over how this would be the best way done. 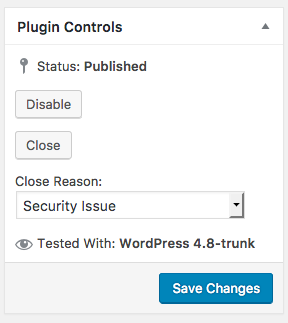 Since the plugins@… system currently isn't segregated to levels, what could be done is a section of wordpress.org, like admin.plugins.wordpress.org that has all the names of each plugin. You just click the plugin, choose from the dropdown menu what type of issue it is and then a redirect will be put in place informing users what the problem is. There is a lot of code to be done here, but my company is completely on-board to help. Then if you are already using WordPress as the framework, it would be a lot easier to handle. All needs to be done is grab the plugin names every day or so and auto-update, then have the drop down that changes what is displayed on the page. No manual typing at all. 2860.diff​ is an initial patch. It's my first meta patch, so any pointers are welcome. 2860.diff​ looks good at a glance. The only thing I'd like to add is some JS code to show the dropdown when clicking the Close button (instead of submitting the form), so that closing the plugin and specifying the reason could be done in one go. JS can be added to refine the flow, but to be clear, it can already be done in one go. The dropdown is currently just shown all the time. So you can select the reason, and then when the Close button is clicked the form will be submitted and the reason will be saved. The dropdown is currently just shown all the time. So you can select the reason, and then when the Close button is clicked the form will be submitted and the reason will be saved. Ah, great. I misread that part of the patch and was under an impression that the dropdown is only displayed if the plugin is already closed. @Ipstenu Is comment:5 what you had in mind? Should the same dropdown be used for disabled plugins as well? 2860.2.diff​ updates the patch to also save the reason when the Disable button is clicked. 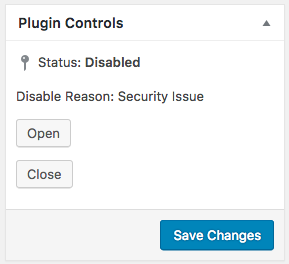 I thought of one question: should the close/disable reason be deleted when the plugin is opened again? Currently nothing is done at that point, so the reason will continue to be stored in the post meta. Yeah, that looks better to me as well. Currently nothing is done at that point, so the reason will continue to be stored in the post meta. I think it's fine, it might be used for future reference if we ever decide to implement a status change history for a plugin. 2860.3.diff​ tweaks the previous patch to better handle the case where the close reason isn't known (like if the plugin was closed before the dropdown was added). It will now show "Close Reason: Unknown" instead of just a blank close reason ("Close Reason: "). #2404 was marked as a duplicate. 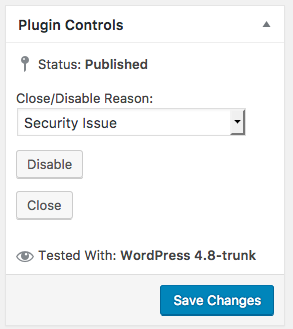 2860.3.diff​ looks great, the only thing I'd like to add is the ability to specify a reason for previously closed plugins without reopening (by clicking "Save Changes"). Will handle that on commit. 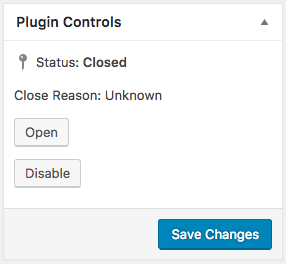 Plugin Directory: Provide the ability to specify a reason when closing or disabling a plugin. Remaining item from Slack discussion: decide whether we should also be logging the reason in the internal notes (which still need a date, see #3001). Perhaps that could be done as a part of #2717. Plugin Directory: Correct the logic for displaying "Close/Disable Reason" dropdown. An audit log that combined closures (like the dropdown value selected, the date, and by whom) along side the internal notes would be 'best'. We must track the time and reason of a closure for this to be viable. 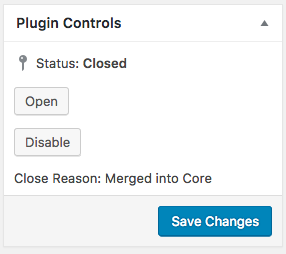 Since a plugin could be closed multiple times, we need to account for that. That does make this very much dependant on figuring out logging, because without logging then there's no way to track time to know when we can reasonably disclose why something was closed. Depends on how you want to handle the open-part. comment:20 and comment:21 still need to be addressed, either via #2717 or separately. 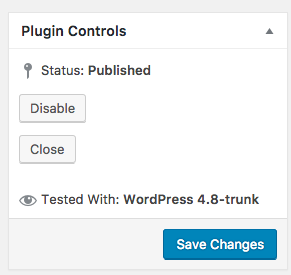 Plugin Directory: Record the date when closing or disabling a plugin. I think we've now fixed all the parts of this: we now store the reason and the date of closure as well as who did it. It also is stored as and shows in the internal notes block. Yep, an additional audit log type proved to be a bit overkill, so it's just another type of internal note, automatically generated when transitioning a plugin between types. Plugin Directory: Use pre-existing meta key name for plugin closing date. I had actually made that public on purpose. Agreed, plz revert. We want it to be public information, visible in the custom fields area.